Most people assume that being in M&T predisposes you to a career in either technology or business. While there is some truth to this (after all, what we study tends to reflect our interests), I have found that many M&T’s have a variety of academic and professional interests that extend past the realm of just business and technology. With this in mind, this summer, I worked at Miramax as a Digital Intern and saw firsthand how technology creates business in industries like media and entertainment. I spent the better part of my time this summer building e-commerce capabilities into Miramax’s website. I had smaller projects as well, including improving the site’s internal search algorithm, building a content header, and generally fixing bugs. I was able to put what I learned in CIS 350 (Software Design & Engineering) about the Agile software development process (basically collaborative and responsive programming) into practice as I constructed the e-commerce portion of the website from the ground up, building up the back-end database, the front-end design, and everything in-between. For working in a creative industry, my work was surprisingly technical. Overall, it was a great experience to be able to apply what I’ve been learning in university in an industry that both interests me and is one that I knew only a limited amount about prior to the summer. It was a bit scary initially to feel like I was deviating so much from the more traditional M&T route of working in tech/finance/consulting, but I was pleasantly surprised to find that though I was working in a decidedly creative industry, I still learned so much about how technology and management play into media and entertainment. Netflix, for instance, has thrived off developing and implementing complex algorithms that aim to quantify something that inherently seems unquantifiable—how much viewers will like shows or movies based on the content that they’ve already consumed. I think I gained many valuable insights this summer into how technology might play into the future of entertainment. We’ve barely just scraped the potential for technology here. Netflix has only just revolutionized the distribution of content; with developing technologies like virtual reality and constantly improving graphics, I wouldn’t be surprised if holographic movies are the norm in ten years or so. Aside from work, I also did many of the tourist-y things that L.A. has to offer with the number of Penn and M&T friends I had out there. Among my favorites, we went to see a taping of Conan (the guy is unexpectedly tall in person), hiked up to the Hollywood sign, and saw Monty Python’s Spamalot at the Hollywood Bowl. Just a general word of advice, it’s probably best not to try to climb up to the Hollywood sign after donating blood two days before. It wasn’t exactly the most pleasant experience I’ve had. Also, to get to a point ten miles away in L.A. can take anywhere between fifteen minutes (probably not), to two hours (more likely). Many lessons were learned this summer, though my summer hardly feels over as I’m currently studying abroad at the University of Edinburgh. I look forward to returning to Penn in the spring semester! Stephanie, from Solon, Ohio, is a member of the M&T Class of 2017. 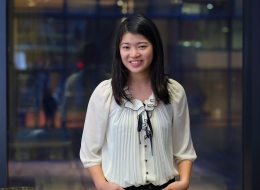 She studies Digital Media Design within Penn Engineering and Finance, Management, and Marketing in the Wharton School.